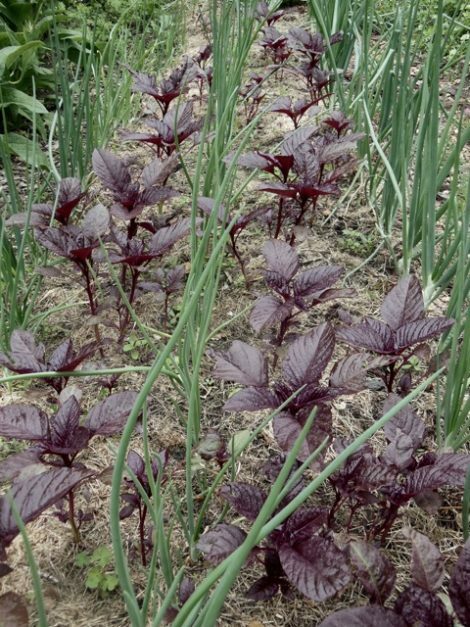 Onion bed with red amaranth. 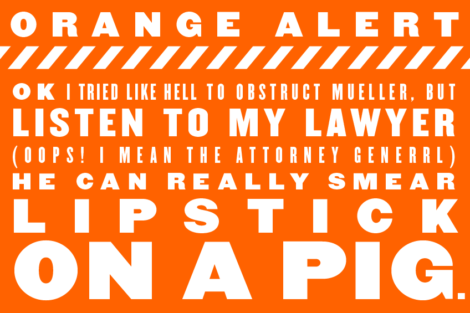 June 23, 2018. Mount Washington — Our gardens, like all of us, grow in relation to wild nature. We breathe the air; drink the water; are buffeted by the wind; and interact with the plants, insects, mammals and other organisms in our environment. Gardeners prepare ground and create a layout within which to carefully place a selection of desired plants, either by seeding or transplant. Before long, intermingled with our meticulously executed scheme, a profusion of uninvited plants appear and would establish themselves. Our response is, most often, to pull them out and throw them into the compost. Self-sown plants, usually deemed “weeds,” may be recognized by a gardener as desirable additions to the garden. For their beauty, I welcomed pale corydalis and red amaranth. 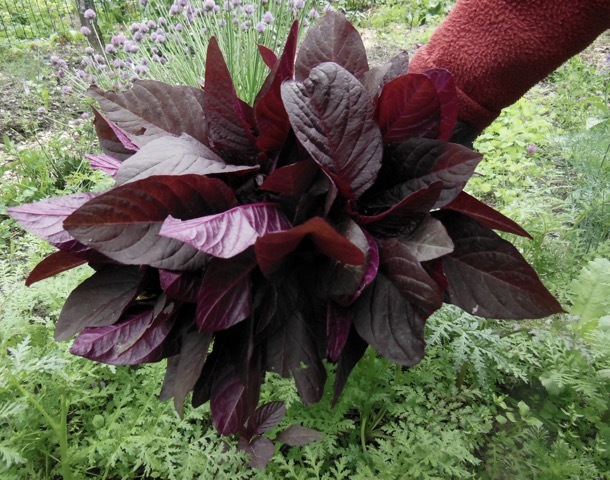 I subsequently discovered that pale corydalis, a North American native, is one of the first spring food plants for hummingbirds; red amaranth is a delicious, nutritious edible for humans. They both self-sow freely but are easy to limit. They are assets in the garden. 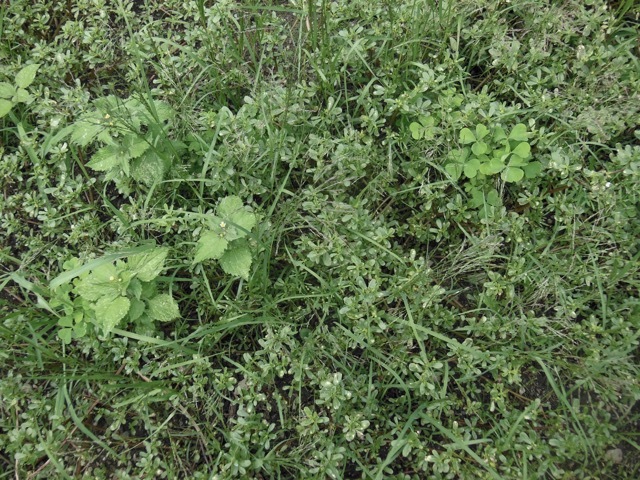 Wild food enthusiasts identify as many edible weeds as there are crop plants on cultivated ground. In my garden, a variety of weeds appear every season; the dominant ones change from year to year. On the menu this year: dandelion, purslane, sorrel, Galinsoga, lamb’s quarter; all are delicious raw and cooked. This is a substantial, pioneering cookbook, “A Wild-Inspired Cuisine” that is attentive to everything from cocktails to dessert. Viljoen is thorough and engaging as she informs the reader about how to identify, collect, prepare, cultivate and exercise caution — for the plant’s and the human’s benefit. All the weeds in and along the roadside near my garden, as well as native plants nearby, are included in this volume. Many recipes are offered for each of three dozen plants. Is it lunchtime? I have a new, quick recipe from “Forage, Harvest, Feast”: Purslane and Tomato Open-Face Sandwich. Menu often includes foraged edibles. At this writing, hen of the woods mushrooms, wildcrafted.